As we enter 2019, there is one thing that all the commentators and punters seem to agree on: no one can really predict what will happen as the months unfold. What form will Brexit take? Will Trump’s trade wars lead to hostility between nations or will he pull off a peace deal with North Korea? What will the gadget be that people flock to? Will 2019 be the year that plastic bags increase to 10p each in the UK and plastic straws become a thing of the past? Against these multilayered uncertainties is the uncertainty that the majority of people have been dealing with for some time: so many of the factors that shape one’s life are determined in realms beyond your control. In boardrooms that decide your pay and hours. In algorithms that shape political decisions. In weather that is more extreme due to the pollution and emissions of the richest. In navigating social interactions charged with pressure to look a certain way, own certain things, or even to pose and pout in a certain way. It is no wonder that more and more people are grasping for something different, whether it is apparently simple solutions offered at the ballot box or stepping outside the mainstream into alternative lifestyles. This individual searching is mirrored in the economy writ large, which also needs to find a different direction. It needs a new project that recognises that the growth-oriented economy of the 20th century has delivered, but that now, many parts of the world are entering a period where growth is bringing a diminishing suite of benefits and often even increasing harm. The institutions and policies that once rendered growth positive (such as progressive taxation, collective provision of health services and education, or labour market arrangements that balanced power more equally between workers and the owners of capital) are being eroded. This is leaving the benefits of growth to be enjoyed by fewer and fewer people. Pursuit of ever more growth is often driving increasing problems that require yet more resources to fix. The pursuit of more poses ever greater risk for people and planet – and yet it, the idea of growth, has a stranglehold on our political and economic systems. It is time for such economies to recognise that they have arrived. ‘Arrival’ is about adequacy, being able to meet basic needs. It is primarily a material notion, a matter of having the resources to deliver a good life. It confronts the ostensibly forbidden question of whether development has a destination. Crucially, however, having enough resources collectively does not necessarily mean everyone individually has enough. Arrival does not imply that everything is resolved and everyone has what they need. Rather, it is the idea that a society collectively has the means for this. Failure to share the world’s harvest, both within and between countries, is one of the most enduring frustrations and tragedies of our time. It is the cause of so many of the challenges and uncertainties that people, politicians, businesses and communities are wrestling with as 2019 unfolds. Perhaps 2019 will be the year in which people recognise that growth has reached a point where a high standard of living could, theoretically, be universal. Realising that possibility demands a new project – using resources in a smarter, fairer way, rather than wasting or hoarding them; focusing on the quality and distribution of economic activity and material resources. That is the task of ‘making ourselves at home’. Once the delusion of growth as both an end in itself and the best of all possible means is discarded, discussion can then turn to what sort of economy we can create, to making better use of what has already been accumulated and, perhaps more than anything, ensuring it is fairly distributed. Many aspects of this ‘grown up’ economy are already in existence – and indeed flourishing. From pro-social businesses to the ‘remakeries’ that are popping up in high streets. From policy makers creating incentives for the circular economy, to the city mayors using participatory budgeting. Making ourselves at home is an economy in which there is scope for continuous improvement. Science and technology will advance. Human creativity and imagination are boundless. The economy will remain dynamic. What changes is the ultimate goal. Making ourselves at home is an ethos of qualitative improvement that is a very different system-wide goal to the sometimes meaningless, sometimes harmful, and sometimes unnecessary, pursuit of more. The economics of arrival by Katherine Trebeck and Jeremy Williams is available on the Policy Press website. Order here for £11.99. In our last blog piece of 2018, Chief Executive Alison Shaw looks at the recent UN report on UK poverty and how there is hope for change in publishing research that challenges inequality, prejudice and poor political and economic decisions. “In December 2014 I wrote a blog post that highlighted how positively Dickensian Christmas was going to be for the many vulnerable people reeling from the austerity cuts to their income and services from austerity measures. I said “it makes me question whether the mantra that we have to cut the deficit is in fact a political position”. Four years on and the situation in the UK is so much worse. Given the significant amount of research we have published that shows the impact of these policies, and what needs to be done to improve the situation, I feel at times, despair. Last month the UK government received a damning indictment of its austerity policies from the UN rapporteur Philip Alston stating its policies were “punitive, mean-spirited and often callous”. As the world’s fifth largest economy, a fifth of the population live in poverty (14 million people) with 1.5 million destitute, and predictions that child poverty will rise as high as 40% over the next few years. This is in the context of a global reduction in extreme poverty from 36% to 10% in the 25 years to 2015, with stubbornly high rates in low-income countries and those in conflict zones. Alston’s report highlights how with “many areas of immense wealth … it seems patently unjust and contrary to British values that so many people are living in poverty”. Evidence from the largest research study on UK poverty and social exclusion – published in two volumes in 2017 – highlighted the startling levels of deprivation in the UK where 14 million people cannot afford essential household goods, 18 million are unable to afford adequate housing, and nearly half the population have some form of financial insecurity. As Patrick Butler said in his Guardian article last week “the fact that more than 120,000 children were living in temporary accommodation in June 2018 is quite simply a national disgrace”. The UN report shows how local authorities have “been gutted” by government policies with a 49% real-terms reduction in funding from 2010/11-2017/18. There is significant concern about the push to privatisation of public services and Who stole the town hall? provides a vivid account of how local government has been hollowed out. Ray Jones looks at ongoing privatisation in social work services and how this trend is threatening the safety and wellbeing of vulnerable children and disabled adults. The report is also damning about Universal Credit and the five week official delay in claimants getting their first benefit “which actually often takes up to 12 weeks and pushes many who may already be in crisis into debt, rent arrears, and serious hardship, requirement them to sacrifice food or heat” (see report page 5). Sam Royston demonstrated in his book Broken Benefits how the social security system is no longer working as a safety net and he presents practical ideas for reform, whilst Ruth Patrick’s five year investigation into the everyday realities of welfare reform shows the significant impact of benefit sanctions and benefits stigma on those in need. The Trussell Trust distributed 1.3m three-day emergency food supplies to people in crisis in 2017/18, a 13% increase on the previous year. The fact that food bank boxes are in every supermarket I find remarkable. The fact that this is celebrated as a positive thing even more so. Kayleigh Garthwaite’s Hunger Pains reveals the truth behind foodbank use, which couldn’t be further from these media messages. The UN Rapporteur heard from many people living in poverty and talked about both despair and “tremendous resilience, strength and generosity” (see report page 2). The powerful voices of those experiencing social deprivation and exclusion resound in our books. 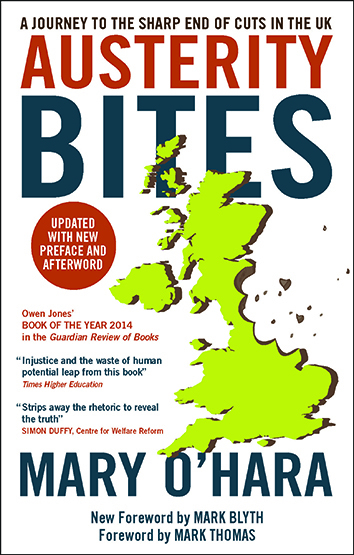 In 2014 Mary O’Hara went around Britain listening to hundreds of hours of compelling stories as the austerity policies started to hit and was shocked by what she found. More recently Paul Sng brought together a collection of portraits and stories of those experiencing the cuts in a powerful photo documentary book that gained wide media attention. As the UN report says and our publishing shows: “The costs of austerity have fallen disproportionately upon the poor, women, racial and ethnic minorities, children, single parents, and people with disabilities” (see report page 18). To us, and our readers, this point couldn’t be more clear. I can’t write about UK political, economic and social issues and not talk about that six letter word. The UN report adds that “the impact of Brexit on people in poverty is an afterthought” (see report page 3). It goes on to say “almost all studies have shown that the UK economy will be worse off after Brexit” (see report page 4). Throughout the chaotic process we have published evidence-based thinking on this crucial issue from experts that we hope clarifies thinking and provides direction. At a local level, Bristol is a city of huge disparity. With areas of significant wealth, it also has 42 areas in the most deprived 10% in England, and 6 in the most deprived 1%, with 20% of children living in poverty (figures from State of Bristol Key Facts 2017-18). This division is reflected in the Brexit vote. Central Bristol, where the University is situated, saw 82% remain voters, yet one of the most deprived wards saw 62% voting to leave. The synchronous development of Bristol University Press and Policy Press sees us confronting global social challenges whilst continuing to publish research that ignites debate about social equality and justice in the UK. The publication of this UN report provides an opportunity to reflect on the evidence we have published and what more we can do to increase understanding, and influence attitudes and policy, across all our subject lists and journals. Early in the year we will be launching an exciting new blog with the key aim of enabling research to impact public thinking, policy and to influence hearts and minds. In addition to this, our ongoing collaboration with projects such as Project Twist-It, Discover Society, Futures of Work and our new charity for 2019, The Green House in Bristol, provide opportunity to support positive social change and spread the word about important social issues. And so we persevere, despite the fact that in the UK “the Government has remained determinedly in a state of denial” about the impact of their policies (see report page 1). We need to change the lives of the 1.5m destitute people in the UK without a home and the 14m people struggling to afford essential household items, never mind presents and celebrations at Christmas. Finally, a huge thank you to all our authors, editors, reviewers, partners and readers for their support over the past year. Without you we would not be able to challenge inequality, prejudice and the poor political and economic decisions that lead to these dire social conditions. If poverty is a political choice there is always hope for change. Wishing you a happy, healthy and positive 2019 from us all. Ray Jones, author of In whose interest? How to turn a crisis into a calamity and catastrophe? Well, it is not that difficult as shown by the current state of children’s social services in England. But it does require commitment and continuity over time. First, see the banker-created crisis of ten years ago as an opportunity. Blame Labour’s commitment to, and expenditure on, public services such as the NHS, schools and children’s social work for creating the crisis, ignoring that it was reckless and selfish behaviours within the financial private sector which took the UK and others to the economic cliff edge. Secondly, when elected to government continue the script that what is required is a good and lengthy dose of austerity with cuts targeted at poor people and public services. Keep this narrative going through a friendly media with programmes and news reports about shirkers and skivers and about failing public services and incompetent public servants. Thirdly, create a self-fulfilling prophecy by cutting funding for public services year on year at a time when families are moving from deprivation to destitution amongst the slicing away of social security benefits so that it becomes harder and harder to provide help for children and families who have been left stranded and neglected by the state. Then ratchet-up the story-line that it is the private sector that is the solution to crumbling public services. Fourthly, change the legislation so that even very personal services such as children’s social work and child protection can be contracted out to private companies who see this as an opportunity to make money. Their route to generating a profit is by cutting back and down-skilling the workforce, reducing terms and conditions of employment, and asset-stripping by selling off buildings and land. And if it all gets too hot, the international venture capitalists who have now come into this commercial market place of the children’s services ‘industry’ sell on their businesses or just walk away. This is now the context for statutory children’s services and social work in England. Companies such as G4S, Serco, Virgin Care, Amey and Mouchel have all attended meetings with the Department for Education to work on creating and opening up this market place, and the market analysts Laing Buisson have been commissioned by the government to advise on how to create a privatised market in children’s social services. And it is already happening. Over 70% of children’s homes in England are owned privately and run to provide a profit. A third of foster care is now provided through for-profit foster care agencies. Almost 20% of children’s social workers working within local authorities are employed through private for-profit employment agencies. And international accountancy firms such as KPMG are now paid by government to shape the future of children’s social services. Hundreds of millions of pounds every year are being taken as private profit out of the public funding allocated to children’s services, money which should instead be used to help and assist children and families in difficulty and to protect children when necessary. So a crisis created by the bankers has been used as the context to sustain policies of politically-chosen austerity creating a calamity for public services and a catastrophe for children and families but also profit-opportunities for private companies. And the commitment of the government is to even more cuts in the funding for public services, even more draconian cuts in welfare benefits, and even more privatisation. Absolutely awful, and it is without shame or humanity from those who still use a crisis of 10 years ago to hurt and hinder children today. In whose interest? by Ray Jones is available with 20% discount on the Policy Press website. Order here for £19.99. As their new book, Protecting children: A social model, publishes this week, Brid Featherstone, Anna Gupta, Kate Morris and Susan White look at how child protection practice must adapt to reflect our changing world. And so it goes on: the roll call of more children coming into care, more children living in poverty, more families using food banks and more families living in overcrowded and unsuitable accommodation. It is painfully apparent that the settlement between the state and its citizens, forged post-war, has been undermined profoundly, if not broken, over the last decades. Increasingly, expectations of decent work, secure and affordable homes and enough to eat can no longer be guaranteed by a state that is experienced as both intrusive and neglectful, especially by those living in poverty, with a subsequent loss of trust and widespread feelings of alienation and disconnection. The policies and practices that have been developed to protect children must be understood and located within this wider canvas. While the state and its resources allegedly shrink, its gaze is harder and its tongue sharper. As part of an increasingly residual role, the system has become narrowly focused on an atomised child, severed from family, relationships and economic and social circumstances: a precarious object of ‘prevention’, or rescue. As its categories and definitions have gradually grown, the gap between child protection services and family support, or ordinary help has, somewhat paradoxically, widened. Indeed, the child protection mandate struggles to move beyond holding individuals (usually mothers) responsible for managing children’s protection, thus, in effect, privatising what are often public troubles and outsourcing their management to those often most harmed by such troubles. When they almost inevitably struggle to cope, state responses incline towards removal and the rupture of connections and networks with ethical and human rights considerations becoming casualties of a risk averse climate and narrow and reductive understandings of children’s outcomes. Austerity has made things very much worse as successive governments, since 2010, have pummelled the poorest areas of our country and the poorest families relentlessly. But it is vital we recognise the roots of our current malaise go way back and are intimately connected to a long-standing tendency to see child protection as something apart, the province of uniquely troubled families and thus disconnected from the wider contexts in which all families seek to survive and thrive. The assessment of risk and parenting capacity is ‘core business’ and interventions are focused on effecting change in family functioning. In our new book Protecting Children: A Social Model we argue for a new story to support more hopeful and socially just policies and practices. This would oblige rooting the protection of children within broader understandings of what all families need to flourish and locating such understandings within the scholarship on inequality and poverty. Crucially, it means developing a range of strategies and practices to deal with the social determinants of many of the harms experienced within families such as domestic abuse, mental health difficulties and addiction issues; all pervasive features of highly unequal societies such as ours. Social work practice needs to be re-thought obliging the re-visiting of the old and engagement with the new. When there is widespread misery and deprivation, how can the individually focused home visit continue too often to be the only game in town? Collective strategies must be considered in a project that promotes community work, locality based approaches and peer support and is founded on seeing families as a source of expertise about system design and best practice. Re-imagining child protection by Brid Featherstone, Susan White and Kate Morris is available with 20% discount on the Policy Press website. Order here for £19.19. A themed section of the Journal of Poverty and Social Justice ‘Roma in a Time of Paradigm Shift and Chaos’ is available online and will be officially launched on 19 April 2018 in Budapest. Here Andrew Ryder and Marius Taba explain how this themed section of the journal explores ideas around Roma communities in times of austerity and change. “The financial crisis of 2008 created a monumental process of turbulence and dislocation in not only economic structures but also in the fields of politics and culture. Nearly ten years after the financial crisis many of the causal factors and consequences of that crisis have not been solved with Roma among the groups most damagingly affected. This themed section of the Journal of Poverty and Social Justice explores notions such as securitisation and how political elites are using the Roma to frame monocultural and xenophobic visions of society. Such trends are leading to the fragmention of the social contract and framing of the Roma in a moral underclass discourse leading to cuts in welfare, workfare programmes and pushing Roma communities further into precarious economic activities. Growing poverty leads to isolated and ghettoised Roma communities which in tandem with racism creates segregated schools and low participation and attainment. These economic drivers in exclusion and segregation have been accentuated by welfare cuts and economic downsizing prompted by recent austerity drives in the wake of the global financial crisis. How might EU policy be reorientated to raise the inclusion of Roma communities? How might the concept of a Social Europe impact upon EU policy and Roma communities? The EU Framework for National Roma Integration Strategies (NRIS) was launched in 2011 by the European Commission. The Framework is based on open method coordination and EU member states are expected to devise National Roma Integration Strategies, which address exclusion in the spheres of employment, health, education and accommodation. Critics claim Roma civil society has either been ignored in the formulation of national action plans or has been accorded a tokenistic say in design and delivery. Moreover, targets have been weak or limited. The European Roma Rights Centre in 2016 concluded “Five years on, the EU Framework has hit ’a mid-life crisis’. The NRIS have yet to deliver in terms of concrete change to the lives of millions of Europe’s Romani citizens; the implementation gap is more pronounced than ever; discrimination and segregation remain pervasive and human rights abuses against Roma are all too frequent”. Critics have argued though that open method coordination, upon which the NRIS is based, supports neoliberal tendencies as its emphasis on dialogue and flexibility deters bolder actions. What might the implications be if the EU project were to fragment and unravel? The European project appears to be in jeopardy with critics questioning its relevance with those on the right of the political spectrum wishing to see a focus on market rather than social matters, and questioning the degree and level of European integration. Recently such sentiments led to the UK electorate opting in a referendum to leave the EU. There are fears that other countries may emulate the UK or that it will bolster those who wish to see the EU reduce its social dimension. How grounded are new trends in Roma Identity? Within Roma communities important questions and new directions have emerged in the performance and articulation of identity. Whilst poverty and xenophobia have led to Roma communities accentuating tradition through bonding networks others have taken radical departures as reflected by the growing Roma LGBT and feminist movement. Is the ’Roma Awakening’, a growing cadre of Roma scholars emerging within the academy who are challenging the positivism of the established academic establishment, some of whom support a European Roma Institute to counter anti Gypsyism, merely a reflection of narrow identity politics and the emergence of a new Roma elite or does it present a fundamental shift in knowledge production and Roma empowerment? Kuhn (1962) described as a paradigm shift, a situation where the anomalies of an established and dominant paradigm are exposed through critique and seeming inability to meet present challenges. On occasion and in the absence of credible responses, there can appear a crisis of confidence in the now vulnerable paradigm (revolutionary phase); if unable to adapt, the old paradigm is consequently replaced with a new conceptual world view, which for a period of time is sovereign in its assumptions, at least until the cycle repeats itself. The emerging paradigm takes as its starting point the theorisation of ethnic and intersectional oppression. The themed section also asks: How effective has Roma civil society been in promoting social justice and how has it fared as a consequence of austerity and contracting funding bases, alongside heavy dependence on a few donors? Critics have highlighted fears of a ‘Gypsy industry’ where civil society offers narrow, outsider-driven and ill thought-out initiatives. However, a dynamic civil society can play a critical role in empowering communities, and shaping policy and forming the bedrock of effective national and European advocacy campaigns, by ensuring that advocacy is grounded in the needs and aspirations of communities. Despite the weaknesses of Roma civil society it has often provided the training grounds and platforms for the handful of younger progressive Roma lawmakers, activists, thinkers and artists that are now taking the political and cultural stage. Given the economic and political challenges confronting Europe Roma civil society may be facing its greatest ever test.